It would be en vogue to say Pop Montreal saved the best for last, especially because Born Gold's noisy, rambunctious church basement sweat-fest was totally insane, but the glittery dance outfit had already proved themselves a Pop highlight at their Friday night Mission Santa Cruz show. 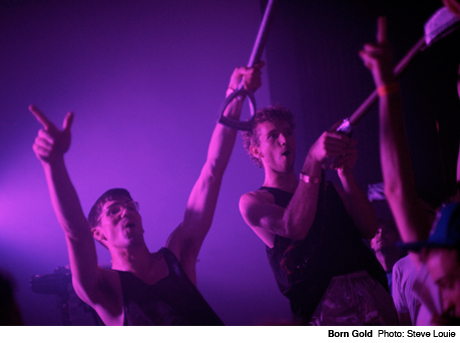 Slotted in as the late-night surprise guests, Born Gold ambushed the audience with a short but sweet set. Big on audience participation, the band came prepared with a trunk full of props, running around the audience with duelling shovels, a giant inflatable ghost and an elementary-school-gym-class-style parachute held up by a crowd of happy dancers beneath it. There may also have been a conga line -- and a circle pit.